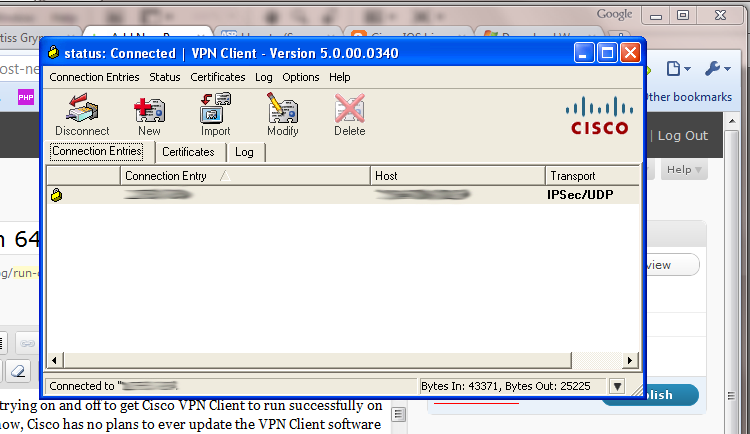 For about the past six months, I’ve been trying on and off to get Cisco VPN Client to run successfully on my computer. 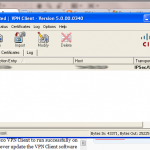 As you may or may not know, Cisco has no plans to ever update the VPN Client software to work on 64-bit Windows systems. Instead, Cisco chooses to strong-arm its clients into purchasing a Cisco AnyConnect. AnyConnect, from what I can tell (I am by no means an expert, so please forgive me if I’m wrong), is a new VPN server that deploys its own client whenever someone connects to it. The catch is, of course, that the entire network needs to be updated and reimplemented in order to use AnyConnect; it’s not something that one or two users can do on their own computers. Since AnyConnect didn’t look like a viable option in my case (after all, there are only about 5 of us using 64-bit systems, and the current VPN setup works pretty well for everyone else that’s using it), I started looking for other solutions.